20% Off Food for Students at Stonehouse Pizza & Carvery Calling all hungry students, did you know you can get a massive 20% discount at Stonehouse Pizza & Carvery! 10% Off Drinks for Students at Stonehouse Pizza & Carvery Enjoy a drink or two for less with your student ID! Gift Cards from £5 at Stonehouse Pizza and Carvery Enjoy a very fulfilling gift from Stonehouse Pizza and Carvery! Easter Menu Available at Stonehouse Pizza & Carvery Eggstra fun is being at Stonehouse Pizza & Carvery this Easter weekend! 2 for 1 Pizzas & Burgers on Mondays at Stonehouse Pizza & Carvery It's great to get more than you bargained for. Get amazing deals today at Stonehouse Pizza & Carvery! Unlimited Breakfast at Stonehouse Pizza & Carvery Feed your morning hunger at Stonehouse Pizza & Carvery! Young at Heart Menu - Main Course & Drink for £4.99 pp at Stonehouse Pizza & Carvery This menu is available every Monday from 12 noon – 3 pm. Valid for the over 60's only! Kids Pizza Parties for £6.99 pp at Stonehouse Pizza & Carvery Take the kids for a party they won't forget. For just £6.99 per person, it won't break the bank! Burger & Drink for £7.99 on Wednesdays at Stonehouse Pizza & Carvery Everybody needs a hump day treat! Cheer up your Wednesday with a burger and a drink for just £7.99 at Stonehouse Pizza & Carvery! Pizza & Drink for £7.99 on Tuesday at Stonehouse Pizza & Carvery Fight those weekday blues with amazing deals at Stonehouse Pizza & Carvery! 2 Pizzas & Bottle of Wine on Thursdays for £15 at Stonehouse Pizza & Carvery What more reason do you need to chillax on a Thursday. Enjoy amazing deals at Stonehouse Pizza & Carvery! 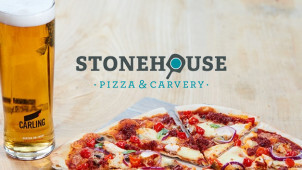 2 Pizzas & Bottle of Prosecco on Fridays for £20 at Stonehouse Pizza & Carvery Celebrate it being Friday with amazing pizza & prosecco deals at Stonehouse Pizza & Carvery! Two G&T's for £9.95 on Thursdays at Stonehouse Pizza & Carvery If you love a G&T, why not check out the one available at Stonehouse Pizza & Carvery! Free Dirty Fries with App Downloads at Stonehouse Pizza & Carvery Get free dirty fries at Stonehouse Pizza & Carvery. Simply download the app to qualify! Pudding for £1.75 with 2 Course Meal Orders at Stonehouse Pizza & Carvery Check out the puddings available for just £1.75 when you order 2 courses at Stonehouse Pizza & Carvery! Serving up real food, that’ll tantalise the tastebuds of all who set foot in the door - Stonehouse Pizza & Carvery is renowned for really fresh food and really great taste. What’s more, is whether you brunch, lunch, go for a Sunday Roast or enjoy a cheeky cocktail at your local Stonehouse - you’ll get incredible value for money too while you have a swell time! Stonehouse takes pride in its menu, with pizzas that are 100% handmade, slow-cooked roasts for sumptuous meats and for a real array of different foods to cater for all fussy eaters and foodies amongst us. You’ll get a real feel good vibe in every single Stonehouse establishment. This is one to visit on the regular, and with over 70 restaurants for you to enjoy in the UK - from Bristol to Ashbank - you’ll be sure to find your local in no time! So for your next family feast, hump day treat, birthday pizza night and more - get your pals or your family to a Stonehouse Pizza & Carvery. Plus, when you can even gift a delightful meal with one of the Stonehouse Restaurant gift cards, you’ll be everyone’s favourite for sharing your Stonehouse love! How do I use my Stonehouse Pizza and Carvery vouchers? All discounts will be applied to your final bill so you can just enjoy your Stonehouse meal! For special savings deals and more on roasts and pub grub, be sure to sign-up to the Stonehouse newsletter. You’ll even get a tasty treat on your birthday - delicious! Does Stonehouse Pizza & Carvery offer a discount to those in the armed forces? Yes! Armed Forces personnel and those in the emergency services can enjoy 10% off at Stonehouse restaurants all year round. See more information on the offers' page and be sure to check the Terms & Conditions. Where is my local Stonehouse Pizza & Carvery? Use the store locator to find the nearest Stonehouse Pizza & Carvery using your postcode! Does Stonehouse Pizza & Carvery have meals for kids? Children can enjoy delicious bites at Stonehouse, from colourful pizzas packed with veggies to everyone’s favourite fish fingers. No empty bellies here! Can Stonehouse Pizza & Carvery cater for those with allergies? You can find all of the nutritional and allergen information online at Stonehouse. Filter for vegan, gluten-free and many more options, then be sure to let your waiter know on ordering. If you are ordering a takeaway, you can order your food at the bar and either help yourself to the carvery or wait a short while for your main meal to be prepared and packed up! Find a Stonehouse restaurant near you, using the online search tool which will then display the contact details for your local. You’ll find the opening hours for each Stonehouse on the individual restaurant pages when you use the National Finder. For pizza night or if you want to get the family together for a delicious and hearty roast dinner - Stonehouse will welcome you - open armed to enjoy those pub classics that you crave! Think tasty, filling food without the hefty price tag when you use Stonehouse Pizza and Carvery vouchers from us. With many more favourite dishes available on the menu, plus veggie options too, Stonehouse is the perfect destination for when you want yummy, fresh and affordable food. Stonehouse also do takeaways. This means you can tuck into your favourite pub classic from the comfort of your own home. What could be better, right? Place your order at the bar and cram in as much into your takeaway box as you can manage. Available any day of the week, grabbing a delicious and great value meal couldn’t be easier- and you won’t have to tackle the dishes after! Stonehouse has a great range of pizzas on offer. Whether you want a classic pepperoni number or a more adventurous choice, you are sure to find something to suit every taste preference. Stonehouse caters for those who are health-conscious too, opt for Stonehouse offers and you won’t over indulge on your budget either! Go for a ‘skinny’ pizza option which promises fewer calories - perfect for when you have a hankering for pizza but don't want to fall off the bandwagon - you’re sure to always find something delicious at Stonehouse.